We are pleased to announce the annual TIM International Physics Conference, TIM18. The event is hosted by the Faculty of Physics of the West University of Timisoara (one of the SEENET-MTP nodes) and will take place between the 24th and the 26th of May 2018. We invite you and your colleagues to submit an abstract for the conference in one of the following tracks: Condensed Matter Physics, Theoretical and Computational Physics, Applied Physics and Interdisciplinary. More information about the conference can be found at the official web site. The deadline for abstract submission is the 15th of April 2018. The meeting will be organized by the University of Craiova, Romania and the SEENET-MTP Network, with main financial support of European Physical Society (EPS) and Romanian Space Agency (ROSA). More information and registration at the website of the meeting. More information are available at website of the BS2018. 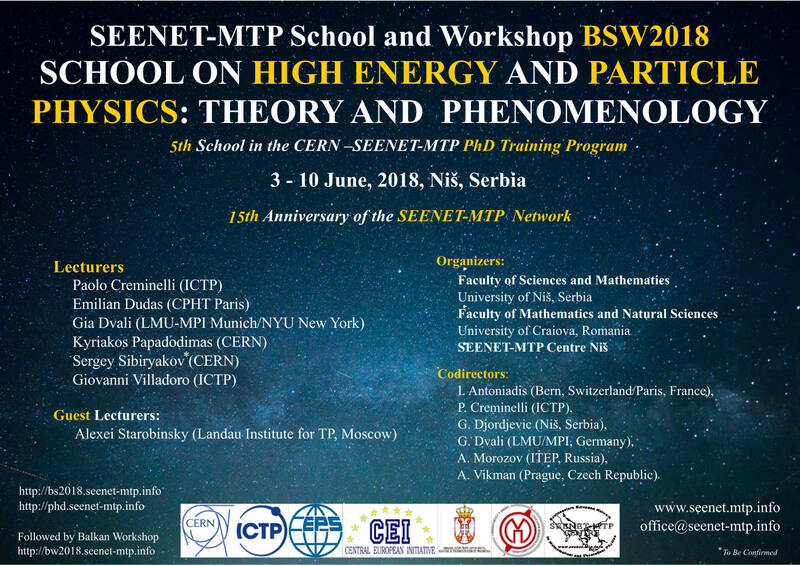 We are pleased to announce the fourth PhD seminar “New Trends in High Energy Theory” in the framework of the CERN – SEENET-MTP PhD Training Program. The seminar will be held at the Faculty of Physics, University of Sofia, Bulgaria, from October 15 (arrival day) to October 21 (departure day), 2017. The event is intended for PhD students with interests in High Energy Physics and String Theory. The students will be given the opportunity to attend lectures from introductory to advanced level. The lectures will be followed by exercise classes. Black holes and holographic correspondence. Supersymmetry and Supergravity – holographic perspectives. Lecturers are Timo Weigand (CERN, Geneva, Switzerland), Atish Dabholkar (ICTP, Trieste, Italy), Anastasios Petkou (AU, Thessaloniki, Greece), Veselin Filev (DIAS, Dublin, Ireland), Nikolay Bobev (KU Leuven, Belgium), Kiril Hristov (INRNE, BAS, Bulgaria) and Radoslav Rashkov (Sofia University, Bulgaria). Members of the Local organizing committee are Hristo Dimov (Faculty of Physics, Sofia University) – Chair, Radoslav Rashkov (Faculty of Physics, Sofia University), Plamen Bozhilov (Institute for Nuclear Research and Nuclear Energy, BAS), Tsvetan Vetsov (Faculty of Physics, Sofia University) and Stefan Mladenov (Faculty of Physics, Sofia University). Members of the Program committee are Gian Giudice (CERN, Geneva, Switzerland), Goran Djordjevic (Faculty of Science, Nis, Serbia), Wolfgang Lerche (CERN, Geneva, Switzerland) and Radoslav Rashkov (Faculty of Physics, Sofia University). More information about the Seminar can be found here. Contact e-mail: or . About origin of the CERN – SEENET-MTP PhD Training Program see here, and information about the previous Schools are available here (Belgrade, Bucharest and Timisoara). We are pleased to announce that 10th jubilee conference of Balkan physical union – BPU 10 will be held in Sofia (Bulgaria) from August 26 to August 30, 2018. More information are available in the poster (PDF). We are pleased to announce that Split Summer School STSS2017 – Space and Time in Physics and Philosophy will be held from July 4th to July 7th, 2017 in Split (Croatia). More information and the program are available here. Deadline for application is June 15th, 2017. Split School of High Energy Physics 2015 (SSHEP 2015) will be held at the Faculty of Electrical Engineering, Mechanical Engineering and Naval Architecture (FESB), University of Split, from September 14 to September 18, 2015. SSHEP 2015 aims at master and PhD students who are interested in topics pertaining to High Energy Physics. Limited financial support will be provided for student travel and accommodation for eligible participants. The application process for the SSHEP 2015 participation is open from March 1st, 2015 through July 1st, 2015. Application in a form of a letter of motivation and a curriculum vitae can be submitted through the SSHEP 2015 web site. Every effort will be made during the selection procedure to produce a well-balanced list of participants in order to promote high academic standards while reflecting international character of the School. Registered participants will be notified about the level of support by the organisers. The International School and Conference on Photonics – PHOTONICA 2015 will be held on August 24-28, 2015 in Belgrade, Serbia. The aim of conference PHOTONICA 2015 is to provide an opportunity for scientists and professionals from various fields with all major topics of current and prospective interest in Photonics Research and Application. The registration and further information, including the list of the invited speakers, can be found at the conference web site. The 8th Mathematical Physics Meeting: Summer School and Conference on Modern Mathematical Physics starts today in Belgrade, Serbia. The Meeting’s programme is mainly oriented towards some recent developments in Cosmology, Gravity, Quantum Field Theory, Particle Physics, Superstring/M-Theory, and Related Mathematical Tools. The Meeting will be held from 24 to 31 August 2014. The meeting is organized by Institute of Physics (University of Belgrade, Serbia) and Faculty of Mathematics (University of Belgrade, Serbia). The 8th Mathematical Physics Meeting is supported by the SEENET-MTP Network. This meeting is the latest meeting in series of mathematical physics meetings that has started at the first German-Serbian Summer School In Modern Mathematical Physics, which was held in Soko Banja in August 2001. We are very pleased to announce a meeting The Modern Mathematical Physics and its Applications that will be held from 12 to 14 September 2014 in Banja Luka, RS, BiH. This meeting is one of the first meetings organized by the SEENET-MTP partner Department of Physics, Faculty of Science and Mathematics (Banja Luka, Bosnia and Herzegovina) and probably the first meeting in Bosnia and Herzegovina devoted exclusively to Mathematical and Theoretical Physics. Scientific orientation of the meeting is related to research at the intersection of modern mathematics and fundamental theoretical physics. Topics in theoretical physics include: string theory, quantum field theory, gravitation, cosmology and particle physics. SEENET-MTP provides a small support for the meeting. The aim of “Danube School on Instrumentation in Elementary Particle & Nuclear Physics” is to bring together graduate students from Universities, from the whole Danube region and the International community. The school is an equal opportunity event intended for MSc, PhD students and postdocs who want to acquire hands on experience in different detector technologies used in Particle Physics and Nuclear Physics, as well. Researchers who are actively involved in the field and are recognized experts in detector R&D, will give lectures and state-of-art laboratory sessions. A second very important aim of this school is to promote future collaborations between young physicists working in the same or similar areas of research. Students are encouraged to attend, contribute and share their experience. More information can be found at a website of the School. Deadline for application is June 15, 2014.